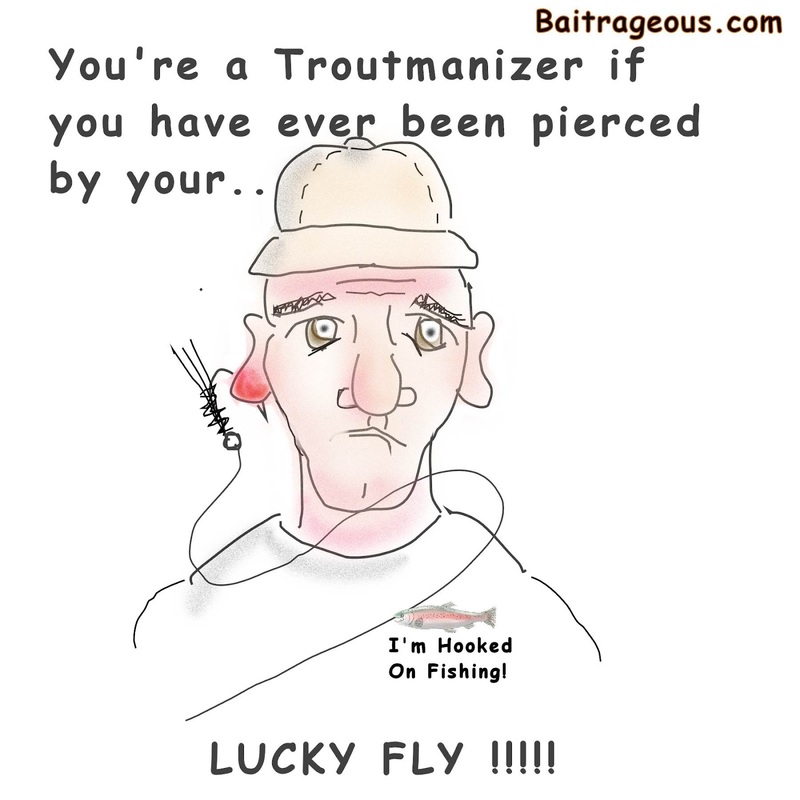 BaitRageous: What is the most popular Troutmanizer cartoon? 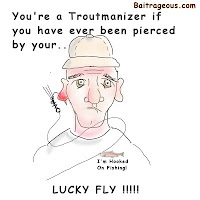 As you may know, I have been blogging about a cartoon series that I created called, "You're a Trout-ma-nizer if." The full series can be found in the tab above with the same title. Anyway, I have been keeping track of the popularity of each cartoon and I'm ready to publish the results by using the total number of page views for the ten cartoons. 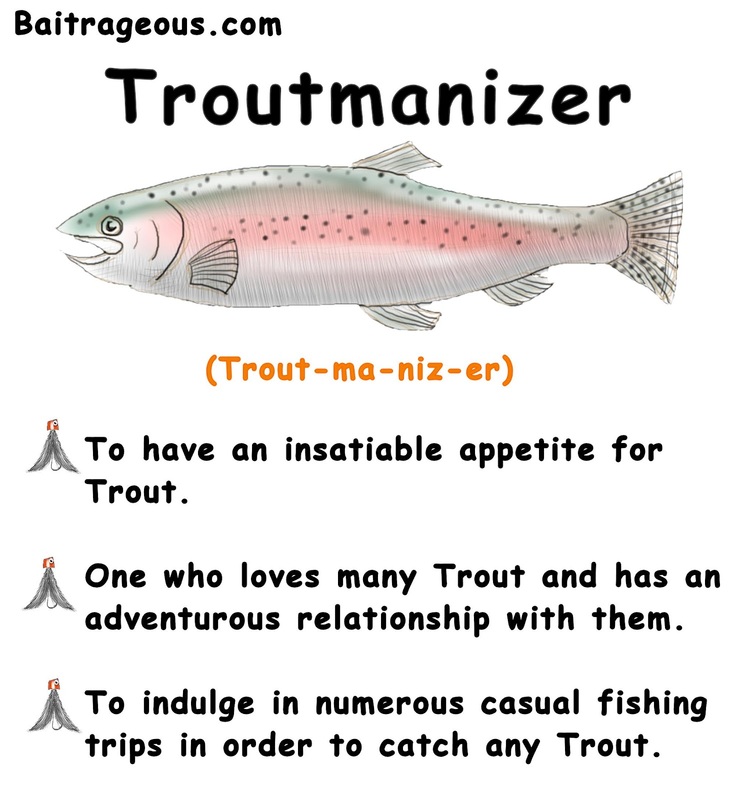 Which Troutmanizer cartoon was the most popular? 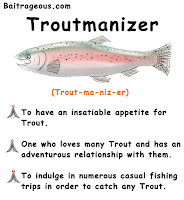 The most popular cartoon was the Troutmanizer definition (above) with 121 page views. Not bad for a new blog that has only 850 total page views for the life of the blog, in fact I may work on a t-shirt design for Troutmanizer. Stay tuned! 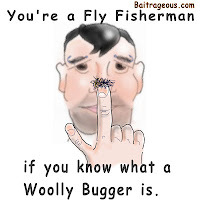 The Second most popular cartoon was, Woolly Bugger at 40 page views on the left. It's my favorite and a lot of folks really liked this cartoon. 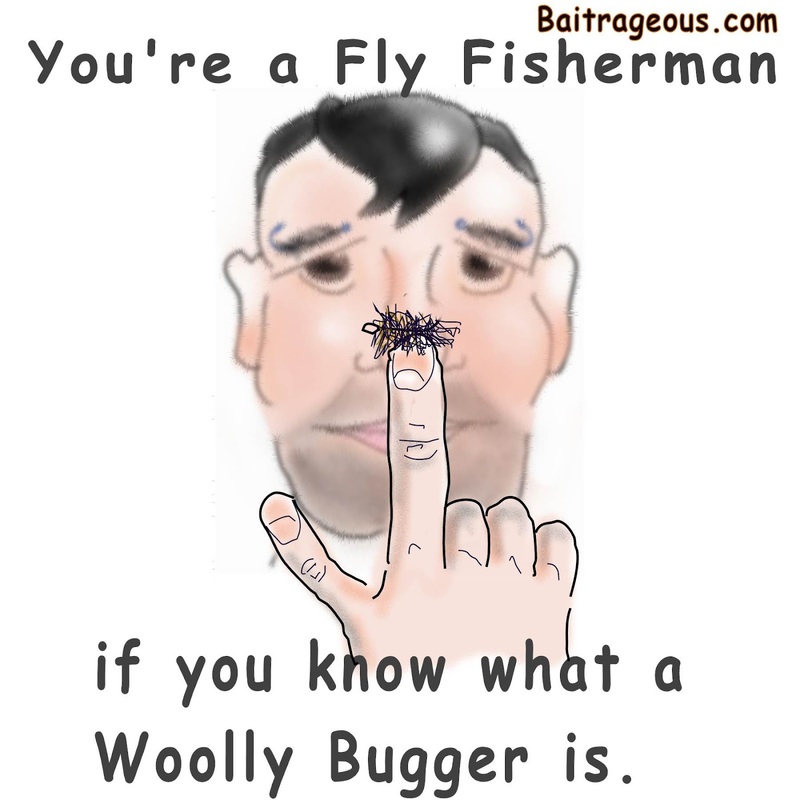 I think it's because of the uniqueness and only Fly Fisherman understand that a Woolly Bugger is not a hairy booger. 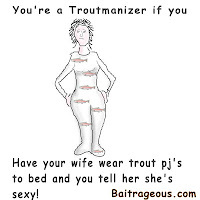 I think it's interesting that the, "having your wife wear trout pj's to bed" cartoon, with 23 views was number 3 and lots of folks thought it was very funny. 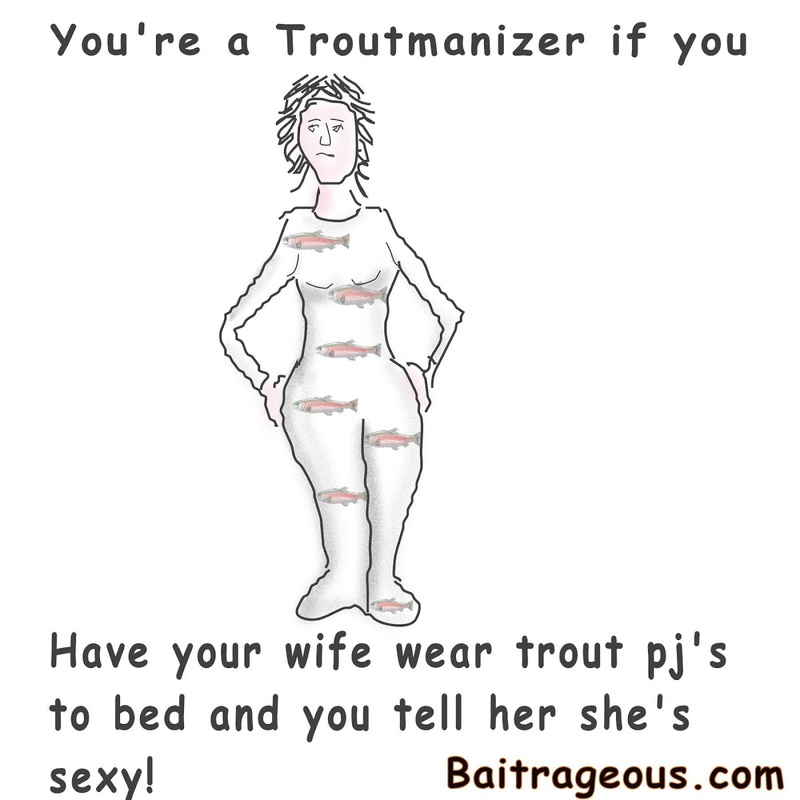 You are definitely a Troutmanizer if your wife wears trout PJ's. Right? The 4th most popular cartoon was, pierced by your favorite fly, on the left with 15 views. If you have ever fished a lot, you have likely been hung by a hook. From the comments, it seems that this cartoon has hit a nerve. Ha Ha! Which cartoon was the least popular? 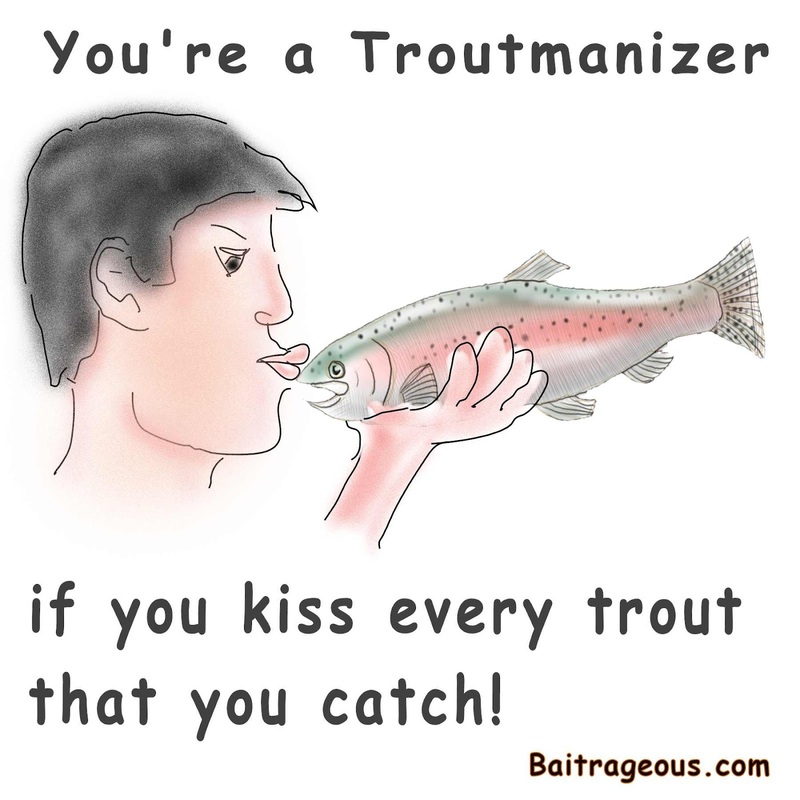 Kiss a trout, with only 5 views. There's just something about kissing a fish that turns off most fisherman. Just don't do it! Hope you enjoyed and stay tuned for more cartoons.